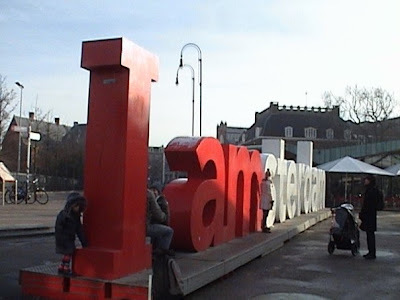 Amsterdam was quite the lively city and a huge melting pot of cultures... which would explain this clever structure, I AMsterdam. I was warned that aside from the "coffee shops," students are sometimes disappointed with the city... I was anything but. And not only on the food front, although I'm sure that contributed to my happiness :). The first night many of us went to an Indonesian restaurant. My pictures don't do the food justice. Not only was this my first time with Indonesian food but it was also in a city known for it's authentic Indonesian restaurant. Not a bad deal, if I do say so myself. Above are Spring Rolls with a spicy peanut sauce that I split with a friend as an appetizer. Of the numerous vegetarian options I ordered the Steamed Vegetables with Tofu and topped with Prawns and another spicy peanut sauce. Oh my, my, my, sounds so simple and yet it was like nothing I have ever tasted before, in the best way, of course. I loved how they served everything in small plates on the side. Our table was filled and mostly everything was eaten by the end! The sauces weren't exactly light but none of us felt heavy, just satisfied, which is always the goal for me. Then we went out for drinks that night to enjoy some local beers. Mmmm, I'm a big Amstel fan. The next day was filled with sight-seeing and museums. 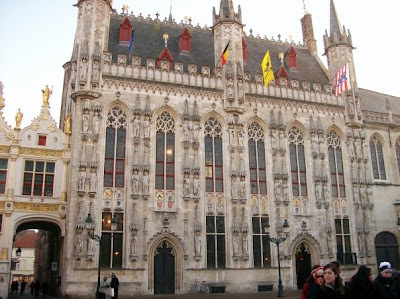 I really like Dutch architecture, there was so many styles to appreciate. We stayed in the most oddly organized hotel. It was a combination of two original buildings and we were scattered all over the place. As a result, when my roommate and I were ready for dinner that night, even after we explored the entire building, we couldn't find anyone. Haha, it took us about two hours, we looked like such lunatics running up and down stairs and knocking on random doors. By the time we gave up we were completely starving and needed food stat. We found our fix at a Turkish restaurant. Okay, it may have been fried, but this totally hit the spot for my Falafel craving. 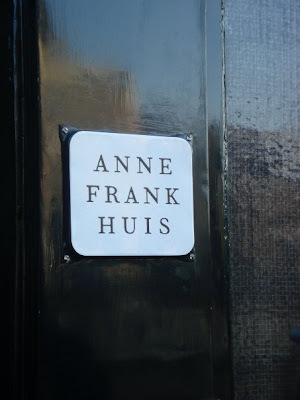 The following day we visited the historic Anne Frank house. It was a fairly expensive museum but so worth it, I was incredibly moved. Our next stop was the Fine Arts museum. Unfortunately it was under construction but the exhibit that was on display was quite entertaining. After taking an art history class freshman year there will always been a spot in my heart for Flemish painting :). and a cold Lentil, Pea, and Spinach salad. Doesn't that just look delicious? It was fun to be able to speak Spanish again to the owner of the small restaurant. I'm excited for Barcelona in a week and half, if nothing else just for that fact! Hopefully I'll be able to get over the "th" ;). Also order some country fresh bread to soak up all the remaining scrumptiousness! I think this was by far my favorite meal. And the night ended very nicely at a wine bar with another wonderful bottle of wine, this time from France. Strolling around Amsterdam, which is actually not as big of a city as I would've have thought, was absolutely delightful. The city is made up of half-circle canals and I think the houses look so beautiful running alongside them. The next morning, following a lecture at the local university, I was in desperate need of hydration and made my way over to the student snack bar. I only bought a bottle of water but I found these great snack bars that they sold, a new health food find! In addition to having a wide selection of health food options the locals are also quite active. Biking is a popular transportation option and they are very serious about getting around. There are bike lanes everywhere and it's literally dangerous to cross through them. I'm telling you, lol, it's scary, a few of my friends nearly got hit and I was constantly on the look out for bikers. There should be warning signs! The last day, a couple of friends and I decided to take refuge in the Heineken museum. We learned all about the creator and history of the beer. This is one of the original brewing rooms in the building. There was also a lot of fun rooms like this one where you could watch advertisements from the beginning of television ads until the day. Clever brain washing, don't you think? There was a section on print advertising as well... this one was my favorite :). By the time we made it through the entire "experience," about two hours later, we were greeted with these lovely things- large glasses of Ice Cold Draft Heineken. The beer is kept at 0 degrees and it was probably the best glass of beer that I have ever ever had. I usually prefer a bottle but this was so very tasty and perfectly cold, I loved it. I don't quite remember what evening it was that we went to the grocery store (definitely not the last night... that was the Red Light District evening, ahem, very eye-opening to say the least) but apparently they're having big sales too! And there was a lot of deals! They had some great-looking products and packaged fruits and vegetables! Plus they don't give you bags because everyone either brings their own and/or carries them by hand. What a nice concept and way to make people be greener by default. Overall, as you can tell, I enjoyed myself in the darling country of Holland. By this time my group only had Cologne and Bonn, Germany left before settling into Strasbourg so the seminar is nearing it's close. Are you ready for French food yet? My loaded camera is getting anxious ;).